What is the MenACWY vaccine? The MenACWY vaccine is given by a single injection into the upper arm and protects against four different strains of the meningococcal bacteria that cause meningitis and blood poisoning (septicaemia): A, C, W and Y. The MenACWY vaccine is called Nimenrix. Read the patient information leaflet for Nimenrix (PDF, 385kb). At what age should teenagers and young people have the vaccine? The MenACWY vaccination is being offered to teenagers and also to first-time college and university students who haven't already had the vaccination. Children aged 13 to 14 (school year 9) are being offered the MenACWY vaccine in school as part of the routine adolescent schools programme, alongside the 3-in-1 teenage booster, and as a direct replacement for the Men C vaccination. The MenACWY vaccine provides important protection, and all teenagers born between September 1 1998 and August 31 1999 are advised to arrange vaccination now with their GP. In addition, anyone born on or after September 1 1996 who missed their routine school vaccination in school years 9 and 10 or the catch-up MenACWY vaccination can get the vaccine from their GP up to their 25th birthday. Students going to university or college for the first time, including overseas and mature students, who have not yet had the MenACWY vaccine remain eligible up to their 25th birthday. They should contact their GP to have the MenACWY vaccine before starting university or college. If that's not possible, they should have it as soon as they can after they arrive. Cases of meningitis and blood poisoning (septicaemia) caused by a highly virulent strain of Men W bacteria have been rising since 2009. Older teenagers and new university students are at higher risk of infection because many of them mix closely with lots of new people, some of whom may unknowingly carry the meningococcal bacteria at the back of their noses and throats. Anyone who is eligible for the MenACWY vaccine should have it, even if they've previously had the Men C vaccine. The MenACWY vaccine is highly effective in preventing illness caused by the four meningococcal strains, including the highly virulent Men W strain. Cases of meningitis and septicaemia due to Men W have been increasing in England, from 22 cases in 2009/10 to 210 in 2015/16. The increase is almost entirely due to the aggressive Men W strain. Although this is rare, it can spread rapidly and cause serious illness in otherwise-healthy children and adults. With early diagnosis and antibiotic treatment, most people with meningococcal disease make a full recovery. But one in three teenagers with Men W have died as a result of the disease. Those who recover can be left with serious long-term health problems, such as amputation, deafness, blindness, epilepsy and learning difficulties. Men W infections are more likely to be fatal than the more common Men B strain. The MenACWY vaccine has previously been recommended only for people at increased risk of meningococcal disease, including people with no spleen or a spleen that doesn't work properly; for Hajj pilgrims; and for travellers to countries with high rates of meningococcal disease, including parts of Africa and Latin America. Read more about MenACWY as a travel vaccine. The MenACWY vaccine is highly effective against serious infections caused by four different meningococcal groups (A, C, W and Y). The vaccine contains only the sugar coating found on the surface of the four groups of meningococcal bacteria. It works by triggering the body's immune system to develop antibodies against these sugar coatings without causing disease. Like all vaccines, the MenACWY vaccine can cause side effects, but they are generally mild and soon settle down. The most common side effects seen in teenagers and young people are redness, hardening and itching at the injection site, fever, headache, nausea and fatigue. These symptoms should last no more than 24 hours. Sometimes, a small, painless lump develops, but this usually disappears in a few weeks. Who should not have the MenACWY vaccine? You should not have the MenACWY vaccine if you are allergic to the vaccine or any of its ingredients. You can find out the vaccine ingredients in the patient information leaflet for Nimenrix (PDF, 385kb). How do meningococcal bacteria spread? Meningococcal disease, including Men W, is caused by a bacterium called Neisseria meningitidis (also called the meningococcus). These bacteria can be divided into 13 different groups, of which five (groups A, B, C, W and Y) are responsible for nearly all serious meningococcal infections. The meningococcal bacteria live in the back of the nose and throat in about 1 in 10 people without causing any symptoms or illness. Older teenagers are most likely to carry and spread the meningococcal bacteria. The bacteria are spread from person to person by prolonged close contact – such as coughing, kissing or sneezing – with a person carrying the bacteria. Very occasionally, the meningococcal bacteria can cause serious illness, including meningitis and septicaemia. Meningococcal infections can strike at any age, but babies, young children and teenagers are especially vulnerable. Read more about how meningitis bugs are spread. The MenACWY vaccine is currently recommended for teenagers as they are most likely to carry the meningococcal bacteria at the back of their noses and throats. 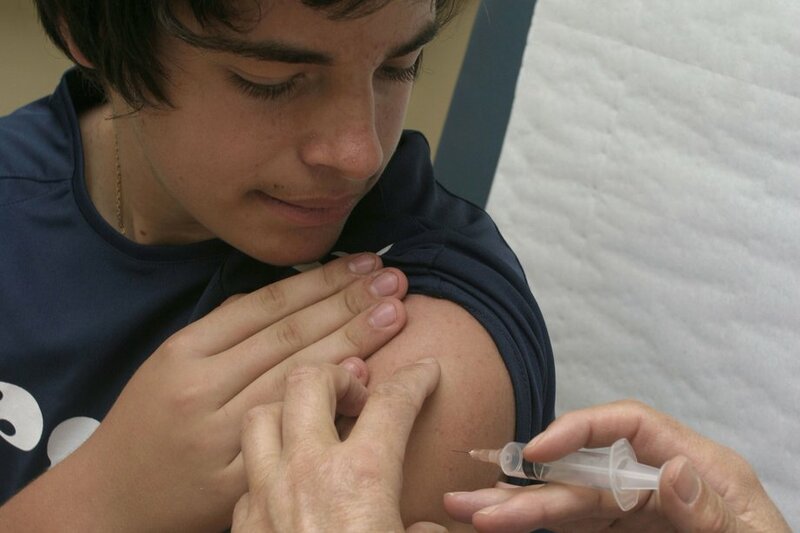 The MenACWY vaccine protects teenagers when they're most at risk of meningococcal disease. It also stops them carrying and spreading the bacteria to other people. Vaccinating teenagers should also help protect other people, including babies and older people, against meningococcal disease, including the highly virulent Men W strain. Men W disease, like all meningococcal infections, can come on suddenly and progress very quickly. All meningococcal infections can cause meningitis and septicaemia, but Men W can also cause other illnesses, such as pneumonia and joint infections (septic arthritis). A rash of tiny red pinpricks may also develop once septicaemia has set in. This rash does not fade under pressure – for instance, when gently pressing a glass against it (the "glass test"). If you, or a child or adult you know, has any of these symptoms, seek urgent medical advice. Don't wait for the rash to develop. Early diagnosis and treatment with antibiotics are vital. Read more about the symptoms of meningitis and the treatment of meningitis. A number of bacteria can cause meningitis and septicaemia, some of which can be prevented through vaccination. The Hib/Men C vaccine is offered as part of the NHS vaccination programme to all babies after their first birthday. The Men B vaccine (Bexsero) is offered as part of the NHS childhood vaccination programme to all babies at 8 and 16 weeks, with a booster after their first birthday. Read this NHS leaflet, which gives information about the MenACWY vaccine for pupils in school years 9 to 13 (PDF, 481kb). Read this NHS leaflet, which gives information about the MenACWY vaccine for new university entrants (PDF, 949kb).